Lets check here AMCAT Network Devices and Routing Algorithms Questions with Answers 2019. Aspiring Minds Computer Adaptive Test is, by far, one of the most sought after employment tests. All the IT job aspirants must write this exam. The big daddies of IT industry like Cognizant Technology Solutions, WIpro, Infosys, Accenture and many more consider AMCAT score as on of the selection parameters. 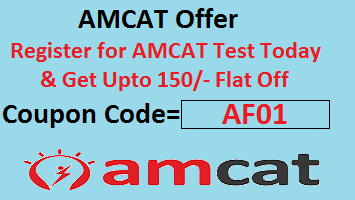 In AMCAT exam, Computer Science is one of the modules, although is not mandatory, but the score of which has a profitable impact on profile visibility. So, its always fair to showcase the Computer Science scores to the recruiter. Here we will be looking into AMCAT Network Devices and Routing Algorithms Questions in the respective module. The marks in Computer Science can get you befitting opportunities like that of Software Developers, Database Administrator and Network Engineers. You need to answer 26 questions in 25 minutes to crack this section. As has been noted, 2-3 questions come from the topic network Devices and Routing Algorithms often. The level of questions is easy and fully concept based. The questions can be easily answered in maximum 1 to 1.5 minutes. Repeater – A repeater operates at the physical layer. It regenerates the signal over the same network before the signal gets too weak or corrupted. This extends the length to which the signal can be transmitted over the same network. It is a 2 port device. Hub – A hub connects multiple wires coming from different branches. Hubs cannot filter data, so data packets are sent to all connected devices. Sometimes this results in data wastage also. 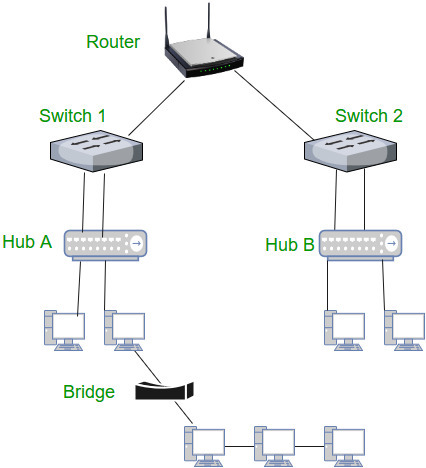 A hub is a multiport repeater. Bridge – A bridge operates at data link layer. It is a kind of repeater, equipped with functionality of filtering content by reading the MAC addresses of source and destination. It has a single input and single output port. Hence it is a 2 port device. Switch – Switch is again a data link layer device. A switch is a multi port bridge with a buffer and a design that can boost its efficiency and performance. Switch can perform error checking before forwarding data. Routers – Router is mainly a Network Layer device. A router is a device like a switch that routes data packets based on their IP addresses. Routers normally connect LANs and WANs together and have a dynamically updating routing table based on which they make decisions on routing the data packets. Router divide broadcast domains of hosts connected through it. Gateway – Gateways can operate at any network layer. A gateway is like a passage to connect two networks together that may work upon different networking models. They basically works as the messenger agents that take data from one system, interpret it, and transfer it to another system. Gateways are in general, more complex than switch or router. A Routing Algorithm is a method for determining the routing of packets in a node. For each node of a network, the algorithm determines a routing table, which in each destination, matches an output line. The algorithm should lead to a consistent routing, that is to say without loop. This means that you should not route a packet to another node that could send back the package. • Path to vector (path-vector routing). Question 2: What is the usual number of bits transmitted simultaneously in parallel data transmission used by microcomputers? Question 4: Which of the following summation operations is performed on the bits to check an error-detecting code? Question 5: Which of the following condition is used to transmit two packets over a medium at the same time? Also Practice questions on below topics. Comment below for any further queries on AMCAT Network Devices and Routing Algorithms Questions.